Create a QR Code with this one-click bookmarklet! A QR Code is simply a piece of text, encoded as a black and white mosaic. Students can decode these using a mobile device running a free app (e.g. I-Nigma | NeoReader | Kaywa). If the QR code represents a piece of text (e.g. a useful fact, or an answer to a question) this will simply be displayed on the screen without there even being a need for an internet connection. If the QR code is instead a link to a webpage or an online video, this resource will be loaded immediately provided there is an internet connection. QR codes are therefore a great way to draw students into reading fresh information and visiting useful websites and giving them new information. When you click the button it will create a QR code of the page you’re visiting. Create QR codes which are textual answers to key questions. Place the QR code on a sheet of paper, with the question above it and the prompt (“To find the answer to this question, scan the code!”). 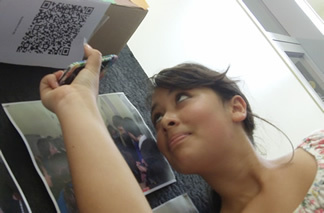 Create QR codes which sit alongside a key image (for example, an unnamed historical character). Students are challenged to scan the code, which takes them to a webpage about that person. They then have to make notes as appropriate or answer a key question which is also provided, or maybe rearrange the QR codes into the correct categories / chronological order to successfully complete the task.